In the last posts, I’ve presented the new ASP.NET Web API processing architecture and described three different hosting capabilities, supported “out of the box”: web hosting, in-memory hosting and self-hosting. In this post, I will describe the development of a custom host using the Azure Service Bus relaying capabilities. This new host enables the exposure of a Web API on the public cloud, while running on a private machine (e.g. my laptop), that is, a machine without inbound connectivity (e.g. private addresses, firewall, NAT). This host design is inspired in the self-host architecture, namely the usage of WCF and its integration with the service bus and WCF. Is composed by the following main components, shown in the following diagram. The HttpServiceBusConfiguration class derives from HttpConfiguration and adds a couple of properties specific to the this scenario, such as the bus authentication credentials (IssuerName and IssuerSecret). Creates an inner HttpServer instance, using the given configuration. Creates a WebServiceHost, using the generic DispatcherService as the service class. Adds an endpoint with the WebHttpRelayBinding binding and a TransportClientEndpointBehavior, which configures this endpoint with the credentials required when listening on the bus. When a request message is received, the WCF runtime delivers it to the DispatcherService, containing generic asynchronous operations to handle GET requests (BeginGet and EndGet methods) and other HTTP methods (BeginInvoke and EndInvoke). These generic operations convert the WCF requests, represented by the older IncomingWebRequestContext class, into instances of the new HttpRequestMessage class. Then, they pushe these messages into the HttpServer pipeline. When the server finally returns the responses’ HttpResponseMessage instances, the generic operations convert them back into WCF messages. The code, still in alpha/”works in my machine” status, is available from https://github.com/pmhsfelix/WebApi.Explorations.ServiceBusRelayHost. This entry was posted in Software and tagged asp.net web api on March 15, 2012 by pedrofelix. In the last posts, I’ve been exploring the new ASP.NET Web API Beta architecture. I started by the high-level processing architecture, then described web hosting and in-memory hosting, i.e., directly connecting a client to the server without going through the network. This post describes a third “out of the box” hosting option: self-hosting. The following code excerpt exemplifies the usage of the HttpSelfHostServer class to host a server on a console application. The HttpSelfHostServer class derives from HttpServer and and is configured by a HttpSelfHostConfiguration instance, as shown in the following diagram. 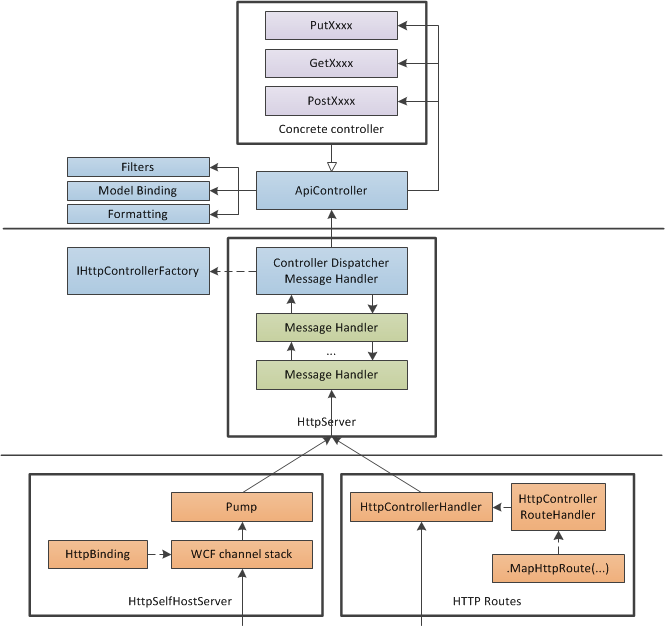 Internally, the HttpSelfHostServer uses a WCF channel stack layer to obtain messages from the transport medium and then pushes them into the upper message handler pipeline. The following section briefly presents the WCF high-level architecture, setting the ground for the description of Web API self-hosting characteristics. 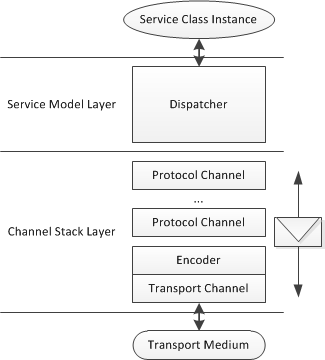 The WCF architecture is divided into two layers: the channel stack layer and the service model layer, as depicted in the following diagram. The lower channel stack layer is composed by a stack of channels and behaves similarly to a classical network protocol stack. The channels are divided into two types: transport channels and protocol channels. Transport channels are responsible by the interface with the transport medium (e.g. TCP, MSMQ, HTTP) (yes, I know, HTTP is not a transport protocol), namely by receiving and sending messages. Protocol channels process the messages that flow up and down through the stack. A typical use case for a protocol channel is the addition of digital signatures at the sending side and the verification of those signatures at the receiving side. The transport channels use encoders to convert between the transport medium byte streams and message instances. obtaining the thread where to call the method. However, the HttpSelfHostServer doesn’t use the service model layer. Instead, it directly consumes the messages retrieved from channel stack layer. The concrete channel stack layer organization is described by bindings, as presented in the following diagram. A binding is a ordered collection of binding elements, where each element roughly describes one channel or encoder. The first binding element describes the upper channel and the last element describes the lower channel, which is always a transport channel. Internally, the HttpSelfHostserver.OpenAsync method creates and configures a HttpBinding instance, based on the HttpSelfHostConfiguration instance properties. Then it uses this binding to asynchronously create a WCF channel stack. 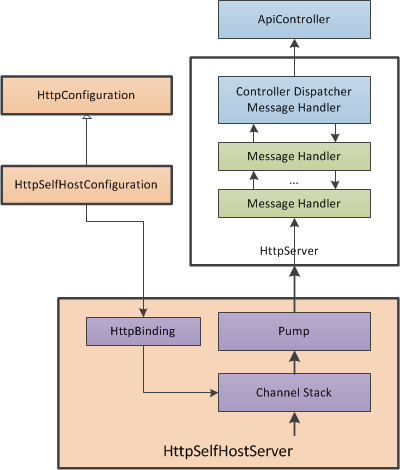 It also creates a pump that pulls messages from this channel stack, converts them into HttpRequestMessage instances and pushes these new requests into the HttpServer, that is, the message handler pipeline. When self-hosting, most of the WCF HTTP binding capabilities and settings are available. The configuration of the internally created HttpBinding instance can be accomplished in two ways. The first is to use HttpSelfHostConfiguration properties, such as MaxBufferSize and TransferMode, that will be used to configure the internal HttpBinding instance. The second is to create a HttpSelfHostConfiguration derived class and override the OnConfigureBinding method, which receives the internally created binding instance. This method has the opportunity to change the binding settings before it is used to create the channel stack. In a future post, I will show how to create a custom host. Until then, comments are welcomed. This entry was posted in Software and tagged asp.net web api on March 8, 2012 by pedrofelix. In a previous post, I described the processing architecture of the new ASP.NET Web API, namely its division into three layers: hosting, message handler pipeline and controller handling. In this post, I’m going to address one of the hosting options: web hosting, i.e., hosting on top of the ASP.NET classical pipeline. On the ASP.NET platform, routing is commonly performed by adding routes to the RouteTable.Routes static property, which holds a RouteCollection. For example, the following code excerpt shows the default routing defined by the ASP.NET MVC project template. A route handler is obtained from the route data. A HTTP handler, implementing the IHttpHandler interface, is obtained from the route handler. Finally, the current request context is mapped to the above HTTP handler. As a consequence, at the end of the ASP.NET pipeline the request is sent to this handler . 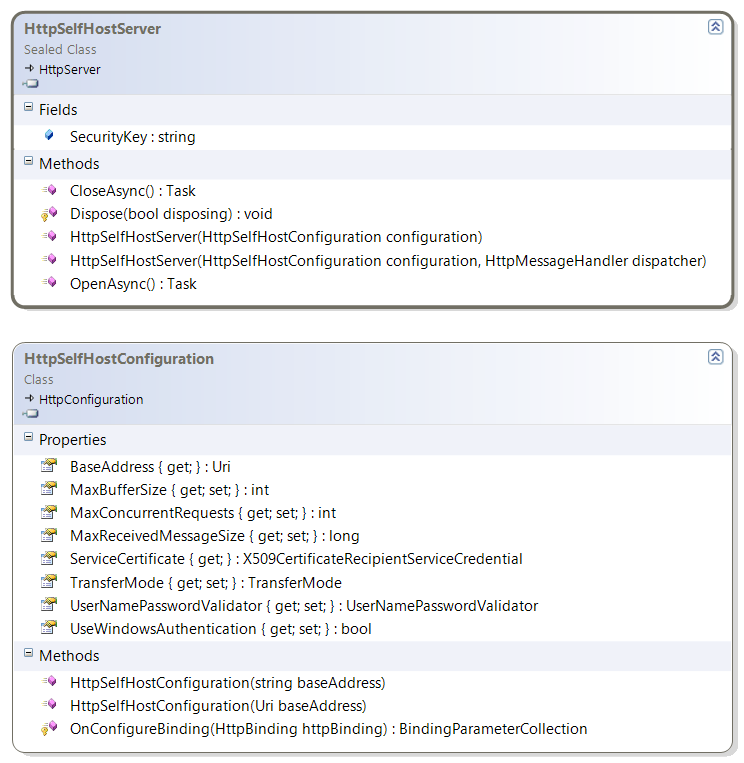 When hosting on ASP.NET, the Web API specific configuration is defined on a singleton HttpConfiguration object, accessible via the static GlobalConfiguration.Configuration property. Web API also defines a couple of new RouteCollection extension methods, named MapHttpRoute, to register Web API specific routes. The following code excerpt contains an example configuration. The static GlobalConfiguration.Configuration property, used to obtain the config reference. Internally, this configuration object points to the global RouteTable.Routes route collection. The usage of the MapHttpRoute extension method, when adding the route. The routes added to the route collection by the MapHttpRoute extension methods use the new HttpControllerRouteHandler route handler . When a route added via MapHttpRoute is matched by a request, the associated route handler returns a new type of handler – the HttpControllerHandler – which implements the asynchronous IAsyncHttpHandler interface. This handler is initialized with the route data, containing the matching information. Creates an HttpServer using the configuration referenced by GlobalConfiguration.Configuration and then pushes the new `HttpRequestMessage` into the server pipeline. After the request is receive by the HttpServer instance, it enters the host independent phase of the processing (the Web API new pipeline). The following diagram summarizes the route resolution process and the dispatch into the HttpServer instance (the message handler pipeline). This entry was posted in Software and tagged asp.net web api on March 7, 2012 by pedrofelix. In the above code, notice how the HttpClient is initialized with the HttpServer, establishing the direct client-server connection. This feature is relevant on integration or end-to-end testing scenarios, by decreasing the time required for a round-trip and avoiding the self-hosting complexity (e.g. URI access control). This feature also illustrates an interesting symmetry between the client and server stacks, around the message handler concept, as described in the following paragraphs. 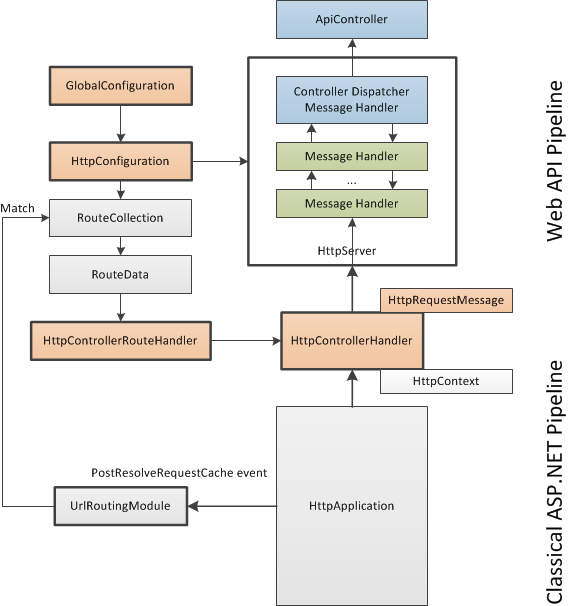 The last post described the ASP.NET Web API server-side processing architecture : what happens since a HTTP request is received until a response is produced. pushes this messages into the above message handler pipeline, wrapped by a HttpServer. Typically, at the end of this pipeline there is an handler that dispatches the messages to the chosen controller. Of special relevance is the fact that HttpServer derives from HttpMessageHandler (composite pattern). The architecture of the new HttpClient class was also described in a previous post, namely the fact that the HttpClient internally uses a HttpMessageHandler to compute the HTTP response, given the HTTP request. It is this symmetry – HttpServer is a message handler and HttpClient receives a message handler – that allows the direct connection of the client to the server, bypassing the server side hosting layer, as showed in the following diagram. This entry was posted in Software and tagged asp.net web api on March 5, 2012 by pedrofelix. This post presents a first overview of the ASP.NET Web API processing architecture: what happens since a HTTP request is received until a response is produced. 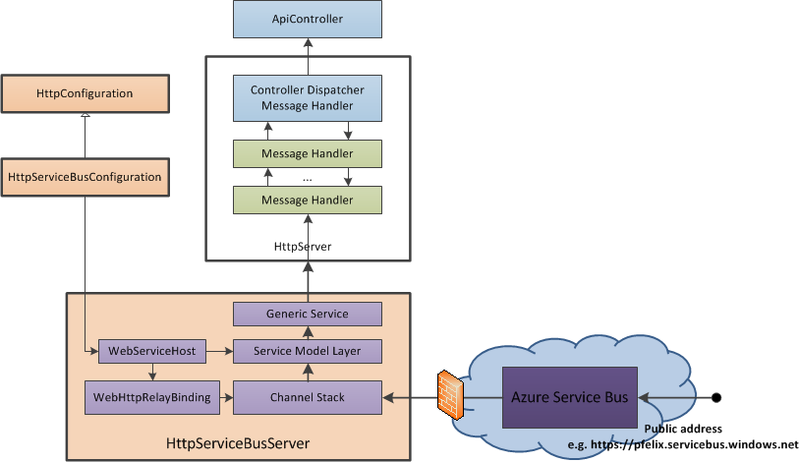 The ASP.NET Web API processing architecture, represented in the following diagram, is composed by three layers: hosting, message handler pipeline and controller handling. The lower layer is responsible for the Web API hosting, i.e., the interface between Web API and an underlying HTTP handling runtime. Succinctly, this layer is responsible for creating HttpRequestMessage instances, and then pushing them into the upper message handler pipeline. The hosting layer is also responsible for processing the HttpResponseMessage returned back from this handler pipeline. Currently, there are two “out-of-the-box” hosting options: self-hosting and web hosting, i.e., hosting on top of the ASP.NET classical pipeline. Self-hosting is based on a pump that retrieves WCF Message instances from a WCF channel stack, converts them into HttpRequestMessage instances and then push those into the upper message handler pipeline. Web-hosting is based on a specific IHttpAsyncHandler, named HttpControllerHandler, that converts HttpRequest instances into HttpRequestMessage. Louis DeJardin created a host on top of OWIN. I’ve created a host based on the Azure Service Bus relaying. The middle layer is composed by a message handler pipeline, similar to the one that existed on WCF Web API. This pipeline is exposed by the HttpServer class, which also extends HttpMessageHandler (composite pattern). Usually, at the top of this pipeline, there is a special handler: the HttpControllerDispatcher. This handler is responsible for obtaining and calling a controller to handle the request. 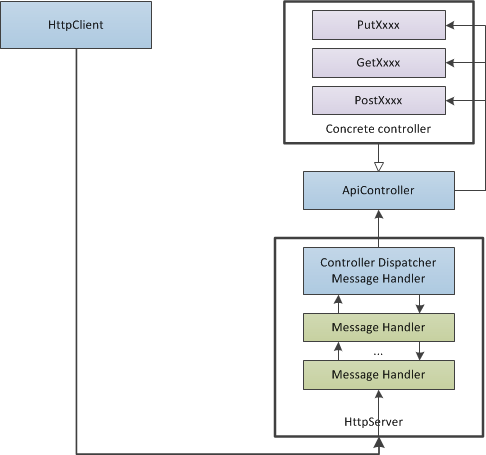 The presence of this HttpControllerDispatcher is only required when using the controller-based programming model (ApiController derived classes). It is also possible to mount a completely different model, just by replacing the pipeline’s top message handler. Response content creation via formatters. This processing is done inside the ApiController instance, called by the HttpControllerDispatcher. Future posts will address each one of this layers in more details. Until then, feel free to use the comments.